Betty Wolf was born Miriam Elisabeth Parsons, on Jan. 27, 1919, in Colorado Springs, Colorado, the only child of James Shoemaker Parsons and Miriam Luther Moore. From an early age, Betty was curious about the natural world and the human body. She delighted in a bleached cow bone she found in the desert. She earned a reputation as a tomboy; trees and phone poles were no match for her agility and bravado. Her childhood was punctuated by 34 moves as the family traveled from Colorado to California during the Great Depression in search of work. They settled in Burbank, Calif., when her father was hired by Lockheed Aircraft Corp.
As a young woman, Betty taught crafts in a local hobby shop, but ballroom dancing became her passion, and the Hollywood Palladium and Big Band music her favorite entertainment. A black Packard was her car of choice, and she had a real eye for fashion. At a desert model airplane competition, she met Walter Wolf, a young aeronautical engineer fresh out of Curtiss Wright Technical Institute. Her heart took flight, and she not won not only the women’s competition but also his hand in marriage on April 24, 1942. Their first child, Judith Lynn, was born in 1944, just before Walt was drafted into the U.S. Army with the 161st Combat Engineering Battalion where he served in the Philippines and Occupied Japan. At the end of the war, Walt returned safely home to Betty and embarked upon a long and successful career in aeronautical and mechanical engineering. They were blessed with two more children: Victoria Lynn in 1953 and Steven Paul in 1956. Beckoning engineering contracts took the family on a series of eight moves, including two across the country, but Walt and Betty greeted each as a new adventure. Walt’s ever-present camera and unfailing eye captured every event. Betty’s artistic talent was evident in every home they owned, and her kitchen was a melting pot of world cuisines. The family took up rock hunting in the desert of Tucson and tide-pooling in La Jolla. Their years near the nation’s capitol in the ‘60’s led to weekend trips into American history with the young Vikki and Steve. In San Diego, Betty joined Toastmasters and became president of her chapter. She dabbled in drama. In Santa Barbara, she earned her pilot’s license in Power Squadron. She completed the “Famous Artists” correspondence course. Even her early drawings were exquisite. In the ‘70s, Betty became a practitioner and then an ordained minister in the Church of Religious Science. Though she retired from the ministry some years ago, her compassionate nature remained obvious to all. Walt concluded his engineering career with a 17-year stint at Hughes Aircraft in Southern California. Upon his retirement in 1985, he and Betty moved to Olympia, Washington, where they relished the quiet, the fresh air, and the evergreen forest that surrounded their home. In 1997, Betty and Walt returned to Santa Barbara to be closer to family. They emerged from retirement and embraced the opportunities that the Adult Education Program presented. Betty honed her artistic skills and took up oil painting, egg tempera, portrait painting, and beading. Walt studied writing, picture framing, singing, and Japanese brush painting. In 2002, they celebrated their 60th wedding anniversary. When Walt died five years later, Betty continued her art and beading classes. “I am alone, but I’m not lonely” she said. She was a member of Santa Barbara Art Association, Goleta Valley Art Association, and the American Society of Portrait Artists. Her works were displayed in many venues in the SB area, and she completed several commissioned pieces. 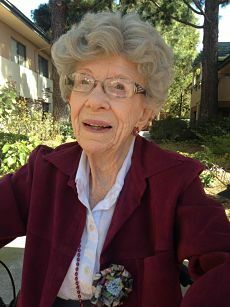 In 2011, she moved to the Vista del Monte Retirement Community in Santa Barbara where she developed many new friendships. She made it her mission to make newcomers feel welcome. She listened well, dispensed love freely, and gave gentle neck massages to those in need of a soothing touch. Betty’s characteristic determination saw her through a summer illness and allowed her to return to independent living and the company of friends at Vista del Monte. She left this world gracefully and at peace, on Feb. 5, 2016, supported by her family and remarkable caregivers from Visiting Nurse and Hospice Care Santa Barbara and Right at Home. She is survived by her daughters Judy Powell (Alan) and Vikki Duncan (Dale) of Santa Barbara; son Steve Wolf (Debbie) of Mission Viejo; and by grandchildren Joshua Paul Wolf and Sarah Elizabeth Wolf. A Celebration of Betty’s Life will be held in the Main Lounge at Vista del Monte, 3775 Modoc Road, at 2 p.m. on Saturday, Feb. 27. Please wear bright colors or something whimsical to honor her spirit. Free parking is available in the back lot of the adjacent church. Follow the signs. Contributions in her memory can be made to The Student Art Fund, c/o The Santa Barbara Foundation, 1111 Chapala St., Santa Barbara, CA 93101; the Animal Shelter Assistance Program (ASAP), 5473 Overpass Rd., Santa Barbara, CA 93111, or to a charity of your choice.